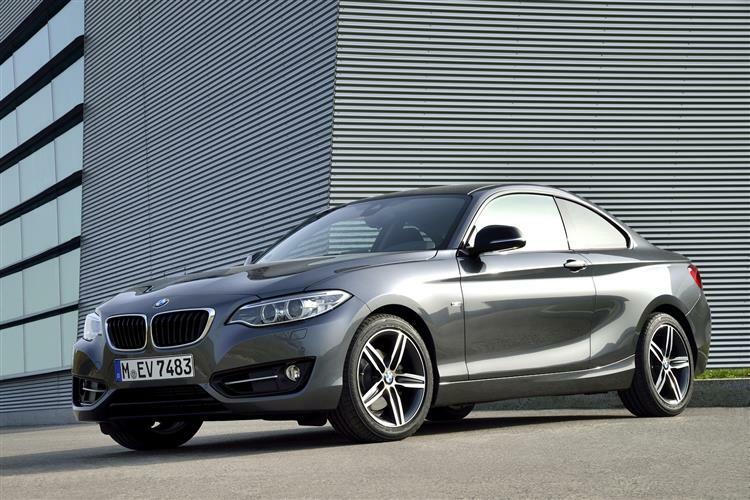 BMW's 2 Series coupe is surprisingly desirable in 220d diesel guise. Jonathan Crouch explains why. 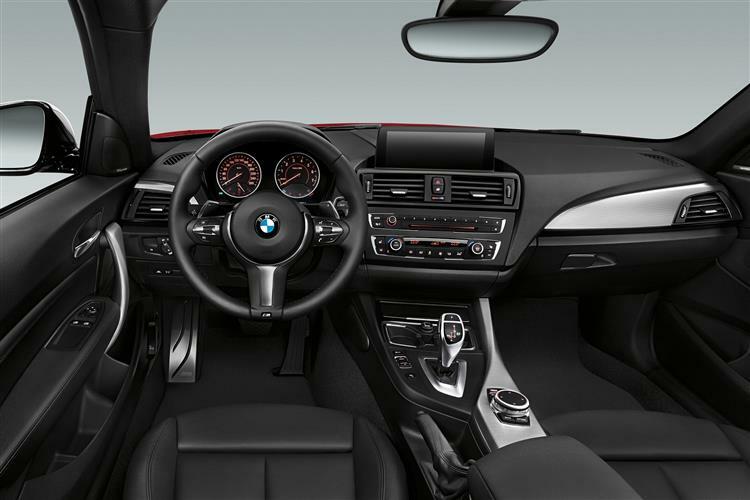 BMW coupes used to be all about compactness, lightness and rapid responses. It's good to know that there's still one that answers the call. This 2 Series might just be the most enjoyable car that the Munich manufacturer builds and it represents a brilliant new take on an old-school theme. 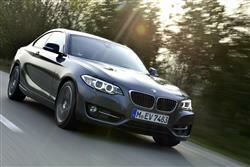 Let's check out the variant that perhaps best combines enjoyment and sense, the 190bhp 220d diesel. When it was first rumoured that the old 1 Series Coupe was going to be replaced by by a 2 Series model in the BMW line up, most of us thought that it would be a simple rebadging job, a facelift at most. You know the drill; new headlights, grille and tail lights, a few different choices of alloy wheels and a paint colours and that would be about the size of it. It was only when we saw the first spy photos of this car being hammered around the Nurburgring that we realised that it was something quite different to the gawky 1 Series coupe. It was longer and lower, with a sleeker roofline. In other words, things were about to get interesting. And so it's proved. BMW kicked the 2 Series range off with a bang, introducing a wide range of models, and it's found instant favour with those who hankered after a lighter, less complex Ultimate Driving Machine. Let's try the volume 220d variant to see whether all those plaudits are justified. 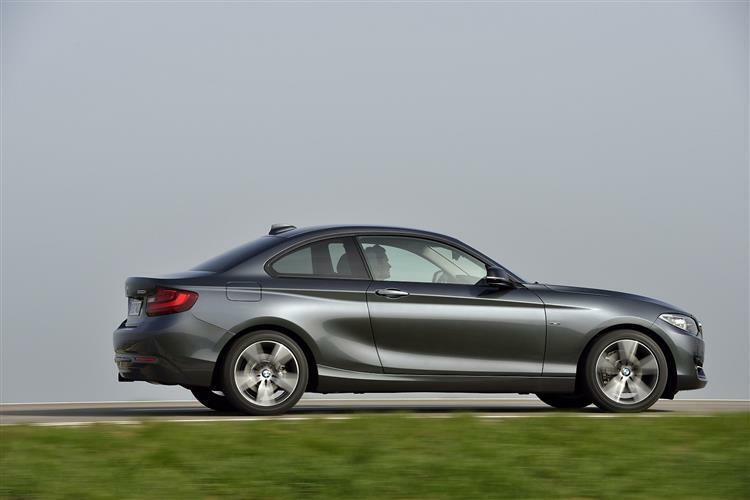 There are certain cars that just feel right within the first fifty metres and this BMW 2 Series is one of them. It's the sum of a bunch of small cues that just hit the right notes; seating position, control weights, engine tractability, suspension refinement, basic ergonomics, that sort of thing. It's much like the thing you've heard about interviewers often making a decision before you've even got into your seat. First impressions are crucial and this 2 Series nails them. 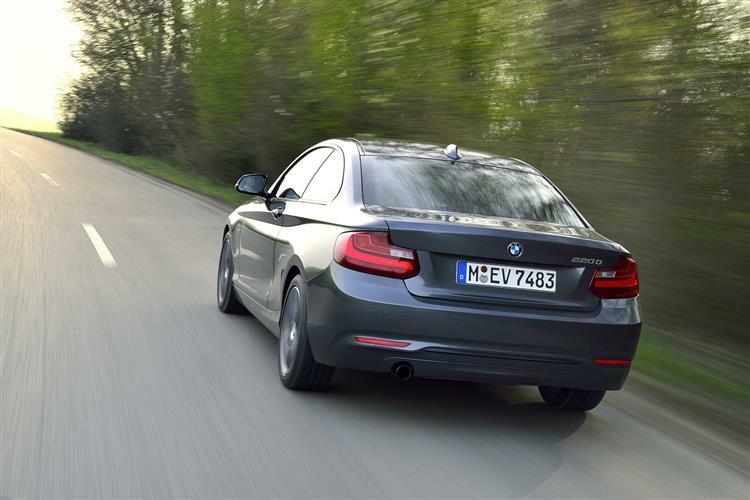 When it comes to diesel options for this car, BMW will sell you a 218d, a 220d or a 225d but they've all got much the same 2.0-litre turbodiesel under the bonnet, just in different states of tune. Respectively you get 150, 190 and 224bhp from them. There's about £4,000 difference in price between the 150 and 224bhp variant but I have to wonder whether a clever chap with a laptop wouldn't be able to turn a 150bhp model into something far more potent in the space of a few minutes. What price your warranty though? 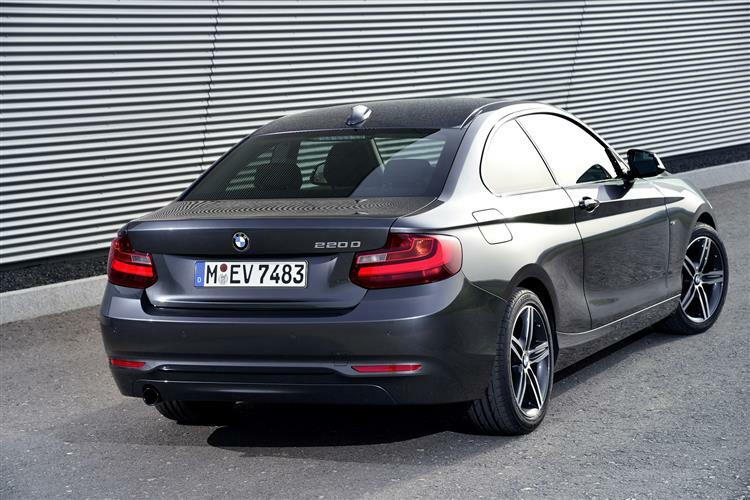 The 190bhp 220d version gets to 62mph in just 7.1s and runs on to 143mph. Do you really need to go much faster than that? If the answer is yes, then there's the auto-only 225d variant that improves those stats to 6.3s and 150mph. The old 1 Series Coupe featured some aesthetics that I never really got comfortable with. From some angles it looked great, all muscle and attitude, while from others it looked about as elegant as Jimmy Nail in Jimmy Choos. This 2 Series though, well, it's a very different story. Squint and you can see elements of the 1 Series Coupe in the shape of the glasshouse, but that gawkiness has gone, replaced by a far more elegant, cohesive look. While I don't think it's quite as good looking as the bigger 4 Series Coupe, it's nevertheless a handsome car. Call it a seven out of ten as a neighbour's curtain twitcher. There's plenty of space up front although shorter drivers might feel as if the high waistline of the car is a bit enveloping. All round visibility is good, with pillars being made as thin as possible and the mirrors are a decent size too. Out back, there's more space than in the old 1 Series Coupe but it's not somewhere a grown adult would choose for any length of time. The two rear seats are well shaped but are best left for the kids or chucking coats and bags onto. Still, some recompense comes with the size of the boot. Although that pinched tail would seem to suggest that the boot's going to be close to useless, if you can post your gear through the fairly small aperture, there's actually a lot of space to play with - some 390 litres in fact. Expect to pay somewhere between £27,500 and £30,000 for your 220d, depending on your choice between SE, Modern, Sport or M Sport trim levels and manual or automatic transmission. Rivals to this model are all front-wheel driven - models like Volkswagen's Scirocco and SEAT's Leon SC, cars that simply don't feel quite the same. Standard kit includes rain sensing wipers, a 6.5-inch display, a DAB tuner, Bluetooth, USB and rear parking sensors. Go for the M Sport trim and you'll get 18-inch alloys, M Sport suspension, sports seats trimmed in cloth and Alcantara, the M body kit, and an M Sport multifunction wheel amongst other tinsel. Oh, and the head liner in anthracite. BMW gets very antsy if I don't mention that. Upgrade to M Sport from SE and it's a hefty £2,350 jump but there are intermediate trims to land on if you don't want to spend that much. Safety is, as you'd expect from BMW, well accounted for. There are the usual twin front, side and curtain airbags, plus a very good latest generation DSC+ stability control system that gives you a bit of leeway when the car's switched into Sport+ mode but will ultimately step in to the rescue if your ambition outweighs your talent. Developing horsepower isn't particularly tricky. Doing it while preserving fuel economy and keeping emissions in check is what separates the best engineers in the automotive world and the rest. And from where I'm sitting it would appear that a good slug of the world's best automotive engineers reside in or around Munich. 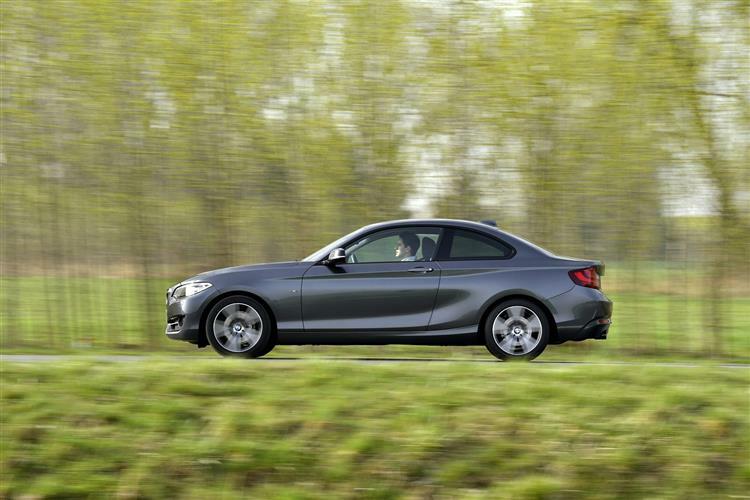 Put simply, the BMW 2 Series needn't be an expensive car to run. Let's take this 220d as an example. The 220d will cost you just under £26,000 in SE trim which might seem a bit steep if you were looking at, say, a Peugeot RCZ 2.0-litre diesel which would save you £2,000 upfront. Then you start looking at the figures a bit more closely and realise that the 163bhp Peugeot will return 54mpg and emit 135g/km of carbon dioxide. It's rated at insurance group 29. Then you look at the BMW. Here you're getting a car with more than 20PS more under the bonnet but which will return 64mpg and emit just 115g/km, a whole banding lower than the French car. Insurance is four groups lower. Then you delve deeper and look at the residual values of the two cars. After three years and 36,000 miles, the Peugeot will be worth less than £10,000 whereas the BMW will still command almost £12,000. If you've been following this from the start, it's not going to come as any great surprise to learn that this 220d BMW 2 Series has racked up a whole load of ticks in the plus column and not a great deal of crosses on the negative side of the ledger. Put simply, it's the car we'd been hoping BMW would build but had almost given up on. It blends just the right amount of modern safety and convenience features with a decidedly old-school approach and we couldn't have asked for any more than that. How does it compare to its key rivals? What rivals? This car doesn't really have any that directly square up to it. There's the Toyota GT 86 at the bottom of the range and the Porsche Cayman at the top, but neither come with diesel engines. Those affordable coupes that do - cars like Volkswagen's Scirocco and SEAT Leon SC - are front-driven and less rewarding to drive. This then, is some car. The best one BMW builds? It gets my vote.